Nearly 6,000 memorials added to online archives such as www.findagrave.com and The IAGenWeb Project. Death is something all humans eventually accomplish. But on the way, many get to be mothers, fathers, sons, daughters, husbands or wives. Cemetery plots aren’t just rectangular pieces of dirt, and gravestones are more than start dates, end dates and life mottos. Most tombstones are adorned with proclamations of admiration for the dearly beloved and the familial relationships that define our lives on Earth. These memorials tell a story. If you’ve been to Find a Grave or Iowa GenWeb to search for family lineages, you may have stumbled upon information about a relative buried in a local cemetery. What you might not have known is that the content at your fingertips was put there by a diligent group of largely unrecognized volunteers, such as Karen Brewer. Brewer recently moved away from Altoona. She has spent untold hours at the Altoona Cemetery and other Iowa graveyards. What started as a hobby tracking down family history has progressed into a daily passion. When packing to visit family overnight, Brewer has to insist to herself that it is alright to take time off. 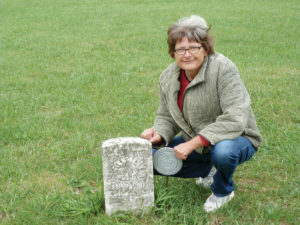 Brewer has uploaded the text of all 786 gravestones at the Altoona Cemetery, and she has added 5,833 memorials to Find A Grave. During the last year or so, Brewer’s health has prevented her from doing her regular, self-assigned alotment of on-site cemetery caretaking and information gathering. That doesn’t stop her from finding a way to contribute. From her Indianola home, she has stepped up her online efforts transcribing and uploading obituaries and attaching the data to the person’s online grave marker. “I now spend my time going back and adding what I can find, or what I know about the person,” she says. Brewer is credited with more than 2,100 online obituary transcriptions, mostly for people buried in Clarke, Cass, Warren and Polk counties. “This isn’t a big number,” she objects modestly. After spending so much time in places many people attempt to avoid, it begs the question: What has she learned that others should know? Rampant vandalism has plagued various cemeteries she has spent time in. But even well-meaning people sometimes cause harm to older headstones while attempting chalk engravings. In many cases, the chalk actually hastens the deterioration of the memorial. She understands that not everyone knows this, and as such, she offers this piece of advice if you are thinking of visiting a cemetery.